ChangingAging explores the hidden dimensions of our humanity and, in doing so, inspires personal growth and social change. Join the conversation today! Changingaging.org presents an article about a specific topic. two profiles were found for Changingaging.org in social networks. Among other social networks the website is represented in Facebook and Twitter. The web server with the IP-address 77.104.146.33 used by Changingaging.org is run by GetClouder EOOD and is located in Bulgaria. On this web server 11 other websites are hosted. The language of those websites is mostly english. 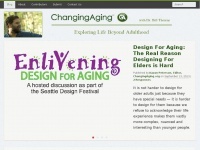 A Nginx server hosts the websites of Changingaging.org. The website uses the shop software system WooCommerce The website uses the latest markup standard HTML 5. The website does not specify details about the inclusion of its content in search engines. For this reason the content will be included by search engines.